The Bansko Blog photo and video competition is now open. The Bansko Blog photo competition is now open. On 1st April 2009 the nominations the top 10 photos and top 3 videos will be put forward to the final Bansko Blog Winter Photo Competition Prize – 2009. The winner will be decided by a panel of judges selected from Blog subscribers. Your photos and /or videos can be from anywhere in the Razlog valley and can be manipulated, enhanced, photoshopped etc. 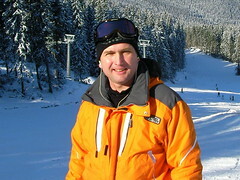 The winner is the photo with most votes and will receive a free Bansko Blog T shirt. The winning video will also receive a Bansko Blog T shirt. The top 10 entrants must agree for their photo and top 3 Video entrants to be published on my web site. Your photos and videos could have been taken at any time in the past 5 years. PS: None of my pictures can win, of course. Are you a property owner, resident or visitor? Then be sure to join the blog to be kept up to date on all things Bansko. New February Guide updated from recent feedback.